It's literally our favorite small festival around, as we wake up to a breakfast buffet in the lodge, spend our days hiking in the National Park, come back for a nap in our cabin at Evergreen Lodge, and then head out for a fun night of live music costume parties. The weather looks to be spectacular the next few days, so if you're out here in California, come one, come all! Click here to learn more and buy tickets. I'll be back at the blog Monday night or Tuesday morning. High Country New reminds us that when citizens of the American West complain that President Obama is a "Socialist", they are forgetting that the region was built upon government subsidies and aid. Indeed, the whole "winning of the West" was a federal enterprise, with the government subsidizing railroads and silver mines and promoting settlement while maintaining an army to keep the Indians out of the way. America's socialized westward expansion was a success, while Mexico's northern expansion, which relied on private enterprise, never got much farther than Taos. But "winning the West" was Manifest Destiny; nobody called it socialism. It turns out that all the environmentally destructive land uses that have been subsidized, like welfare ranching and dirty energy, have caused some pretty severe and expensive environmental, health and safety problems. Well here's a bit of good news. According to a new report, water use in the U.S. was less in 2005 than in 1975, in spite of a 30% increase in population during this period. began the series of five-year trend reports--along with the population that depends on these supplies. , mining and rural domestic uses. I honestly had no idea that this much of our fresh water is used to produce electricity. Given that water is the next oil, this is yet another reason why we need a massive effort to advance wind, solar and energy efficiency technologies. We just can't afford to be using this much fresh water to produce electricity (which is an issue with solar thermal plants as well -- though they can use alternative fluids). On irrigation, we can do far better still, and the amount of water that gets sucked out of rivers to feed crops and livestock in deserts is still pretty obscene. With a new baby, one of our life-savers that she loves is an electronic swing, which for some reason is battery powered. I sure wish we could just plug it in, as we need to replace the batteries -- 4 D's -- about every 4 or 5 days. Fortunately, we have a couple of battery chargers -- each several years old -- that work great, and several sets of rechargeable batteries. So instead of having to run out and buy new batteries every few days, and dispose of dead batteries every few days (into our electronics recycling bin of course), we just recharge 4 at a time and we're good to go. In this economy, if I had to buy each round of batteries we're using, I'd be crying as much as the baby! I once read, I think in the Real Goods Solar Living Handbook, that a set of 4 rechargeable AA batteries lasts so many recharges that if you purchased those batteries one pack at a time, you'd be spending something like $1,600 (and that doesn't include the gas, time and parking from trips to the store). I haven't been counting, but we rarely have to buy new sets of rechargeables -- so that sounds about right. As a bonus, of course, we're keeping hazardous waste out of the landfill, and reducing the amount of cardboard and plastic battery packaging that we have to recycle. Even better, rechargeables are wonderfully convenient -- plunking batteries back into the recharger for a few hours is much easier and less less time-consuming than having to go out to the store. Using rechargeable batteries is really a no-brainer of a money-saving green practice. If you haven't gotten yourself a recharger yet, give it a try. You'll be glad you did. The NY Times offers opinions by several leading experts on how we are going to feed a growing human population over the coming decades -- especially when faced with dwindling freshwater supplies and fertile agricultural lands, and increasing climatic uncertainty. What will drive the next Green Revolution? Is genetically modified food an answer to world hunger? Are there other factors that will make a difference in food production? If these analyses are correct, then we are on what Kopits called “a narrow ledge”: Houston needs $75 oil to keep drilling, but the economy goes into recession with oil at $80. Two editors of The Oil Drum generally concurred. Nate Hagens put the boundaries a bit wider at $60 to keep drilling and $80-$100 as the economic pain tolerance point, and Gail Tverberg observed that oil at $75-$80 seems to kick off a recession. If the stability of oil production relies on oil spending staying within roughly 4% and 5% of GDP, it’s going to be dicey. But if the oil price ledge is only $5 wide, then it’s not clear to me whether the global GDP can manage to stay on it. In short, the world may not be able to continue executing the expensive oil projects of the future at all. The tension between the price of new production and the pain tolerance of the global economy may be resolved not by stable prices, but by a failure to bring new supply online. This is indeed a crisis—but it’s also a hint that it’s time to focus on how we’re going to replace oil. Bottom line: The sooner we can get our plug-ins and electric vehicles out on the road, the more secure our economy will be. As America and the world move forward devising climate change and clean energy policy solutions, one thing we absolutely have to pay close attention to is what the science tells us are truly the sources of greenhouse gas emissions. Then we have to cap those sources to the levels our best experts recommend if we are to avoid catastrophe -- the latest recommendation being 350 ppm. To ignore a massive source of emissions, such as those from land use change -- which Grist's Tom Philpott writes about here -- is to invite failure, likely with extraordinarily expensive consequences. To view the current policy problem we're dealing with here more clearly, let's use the figurative example of a discussion about eliminating a source of cancer-causing pollution from our drinking water supply. If scientists told us that we had to get concentrations of the imaginary carcinogen, "Cheneyite", down from current levels of 100 ppm to below 50 ppm to avoid causing a currently observed spike in testicular cancer, we'd have to first identify all the pathways by which Cheneyite enters the water supply. We'd also have to make sure that each of these sources of Cheneyite are capped to the level needed to achieve an end result of at most 50 ppm in our drinking glass. The need to cap emissions from all sources of heat-trapping gases if we are to successfully stop climate change is similar. To exclude the contribution of land use changes related to biofuel production (e.g., conversion of carbon-absorbing forest to industrial cropland) from climate policy is to invite failure, at a potentially catastrophic cost to humanity. [They] does not count CO2 emitted from tailpipes and smokestacks when bioenergy is being used, but it also does not count changes in emissions from land use when biomass for energy is harvested or grown. This accounting erroneously treats all bioenergy as carbon neutral regardless of the source of the biomass, which may cause large differences in net emissions. For example, the clearing of long-established forests to burn wood or to grow energy crops is counted as a 100% reduction in energy emissions despite causing large releases of carbon. It should be noted that this “flaw” in U.S. climate policy is no accident. House Ag committee chair Collin Peterson fought like a pitbull to enshrine it in Waxman-Markey. To the agribusiness lobby Pererson represents, tarnishing the good name of ethanol is tantamount to setting fire to a Bible during Sunday school. Philpott also pointed out other dangers posed by a climate policy that does not intelligently think through how best to use biofuels to achieve our emissions-reducing goals. Another article in the same Science issue explores another massive problem with biofuels: water scarcity. As the author puts it: “A widespread shift toward biofuels could pinch water supplies and worsen water pollution. In short, an increased reliance on biofuel trades an oil problem for a water problem.” (Emphasis added.) According to the author, it takes between 90 and 190 liters of water to extract a kilowat-hour worth of oil. To get the same amount of energy from corn-based ethanol? Try 2.2 and 8.6 million liters of water. Ouch. The bottom line here in climate policymaking is that we need to look at what the best available science tells us about all the potential solutions -- not only at what levels we need to implement them to achieve our goals (e.g. to get CO2 levels back down to 350 ppm), but also what the unintended consequences might be for a particular proposed solution (like corn-based ethanol). If we happen to ignore -- for political reasons -- a major source of emissions like land use change as Philpott describes above, it's not like Mother Nature and Sister Climate are going to negotiate with us and say, "OK, fine, we'll stop the warming-induced glacial melt and sea level rise and spare your agricultural and drinking water supplies -- and throw in your coastal cities -- if you can cap your emissions at 450 ppm". We ignore our best experts at our peril. Unlike Congress, the climate doesn't compromise. Sometimes we learn about new twists to the story of how humanity's burning of fossil fuels (oil, coal, natural gas) is causing a blanket of heat-trapping gases like carbon dioxide (CO2) and methane (CH4) to build up in our atmosphere. In this particular case, Grist reports that faulty wells, pipelines and other infrastructure problems are causing leakage of an unbelievable amount of methane into our atmosphere (methane is 25 times more potent of a heat-trapping gas than CO2). This waste is not just mind-bogglingly polluting, but is also obscenely expensive -- it could could be worth over $50 billion per year! The EPA estimates that 3 trillion cubic feet of the invisible gas unintentionally escape into the atmosphere each year from patchy gas and oil wells, pipelines, and tanks. This accidental loss alone is equivalent to about half of the global warming power of all U.S. coal power plants emissions. That is the same climate impact of a quarter billion cars. Roger Peilke Jr., professor of environmental studies at the Center for Science and Technology Policy Research at the University of Colorado at Boulder, does an admirable job of estimating the commercial value cost of leaking methane at $24 billion. But there is more to the story—the cost to society of this methane leakage adds up to a much higher number. Methane, like CO2, carries a social cost which must be accounted for—each ton emitted into the atmosphere exacts a toll. Weather variability will threaten crops; rising sea levels will submerge coastal lands; insurance premiums will rise as more homes are at risk of flooding and fires. As global warming worsens, these costs will become sharper, causing economic pain across the globe. Though no one benefits from leaking methane, we all pay for its effect on our climate. Recently, the Department of Energy used a conservative estimate, $19, to price out the cost to society of a ton of CO2 emissions. Knowing that, and the fact that methane is 25 times as potent as carbon dioxide, we can do some simple multiplication and determine that the social cost of leaky methane hovers around $29 billion annually. This is in addition to Professor Peilke’s commercial value lost, bringing the grand total to over $50 billion. Yeesh! This is another reminder of just how beneficial to America it will be to get climate change and clean energy solutions legislation passed in Congress ASAP. The sooner we can get ourselves off of these damaging fossil fuels, the better. 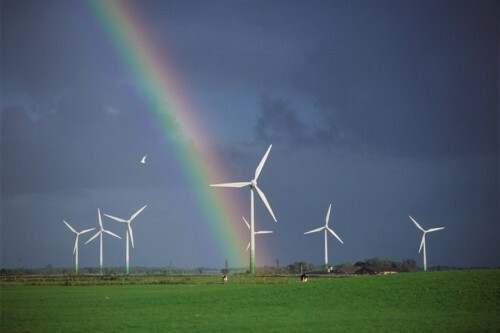 What are the most effective, convincing ways to convey the promise offered by green jobs? Sightline has just released a messaging guide on the subject. With the public's belief in global warming seeming to be less (this month at least), it's important to remind citizens and decisionmakers what the best experts in the world on the subject think. Last week, the heads of 18 top scientific organizations released a letter to the U.S. Senate to reaffirm the scientific consensus that climate change is occurring and is primarily caused by human activities. In a statement sent to all U.S. Senators on October 21, 2009, the leaders of 18 scientific organizations stated that "rigorous scientific research" demonstrates that the greenhouse gases emitted by human activities are the "primary driver" of climate change. "These conclusions are based on multiple independent lines of evidence, and contrary assertions are inconsistent with an objective assessment of the vast body of peer-reviewed science," the scientists wrote. Dr. May Berenbaum, President of AIBS, signed the letter on behalf of the society. "The evidence that human activities contribute to global climate change is compellingly consistent and clear; constructive human activities to stem or reverse these changes are now urgently needed," she said. The letter called attention to the impacts of climate change on human society, the economy, and the environment. The "broad impacts" of climate change include sea level rise, greater threats of extreme weather events, and increased risk of regional water scarcity, wildfires, and the disturbance of biological systems throughout the United States. "Climate change is surging through and rending Earth's biodiversity," said Dr. William Y. Brown, President of the Natural Science Collections Alliance. "If we do not stem the tide of our own greenhouse gases now, we simply invite and magnify future harm and cost." "Climate change is real, and plants know it." said Dr. Kent Holsinger, President of the Botanical Society of America. The consequences will be significant for our food supply, which depends upon plants and their pollinators. The scientific organizations that sent the letter represent the breadth of the scientific community. Collectively, these organizations serve more than 10 million scientists. The 18 organizations that signed on to the letter include: American Association for the Advancement of Science, American Chemical Society, American Geophysical Union, American Institute of Biological Sciences, American Meteorological Society, American Society of Agronomy, American Society of Plant Biologists, American Statistical Association, Association of Ecosystem Research Centers, Botanical Society of America, Crop Science Society of America, Ecological Society of America, Natural Science Collections Alliance, Organization of Biological Field Stations, Society for Industrial and Applied Mathematics, Society of Systematic Biologists, Soil Science Society of America, and the University Corporation for Atmospheric Research. That's a pretty broad consensus -- from meteorology and ecology to agronomy, to geophysics and atmospheric research to mathematics. Still not convinced? Ambassador Holger Standertskjöld, head of the delegation of the European Commission to Singapore, said climate change is one of the biggest environmental, social and economic threats facing the Earth today. It impacts on biodiversity and is one of the causes of biodiversity loss and exacerbates other pressures. “Coral reefs and mangroves provide natural shoreline protection from storm and flooding. Marine and terrestrial ecosystems currently absorb half of anthropogenic carbon-dioxide emissions. This means climate change will accelerate further if biodiversity and ecosystems are not effectively protected,” Standertskjöld said. Biodiversity, he said, is important for all human beings because at least 40 percent of the world’s economy and 80 percent of the needs of the poor come from biological resources. “Biodiversity benefits people through more than just its contribution to material welfare and livelihoods,” he said, noting that it contributes to security, resilience against climate change, social relations, health, and freedom of choices and actions. “We are stewards of a wonderful natural legacy that we need to pass on intact to future generations. But, sadly, biodiversity loss continues at alarming rates, with serious potential consequences for sustainable livelihoods and sustainable economic growth,” Standertskjöld said. If carried out well, global warming solutions aimed at conserving tropical rainforests should go a long way toward protecting their biodiversity and ecosystem services. Food glorious food -- the topic of how we are going to feed a growing human population faced with disappearing fresh water supplies and agricultural lands is getting lots of play these days. “If you look carefully at global data, the most engineered crop is soybean. Ninety per cent of US acreage, 98 per cent of Argentina acreage and 60 per cent of Brazil are engineered,” he said. “Scientific data show that on an average Roundup soybean has 10 per cent lower yield than non-engineered soybean. So if you want to feed more people, genetically-engineered soybean will not be the answer,” he said. Genetically engineered drought tolerant corn and wheat, Hansen warns, show greater yields than normal ones during drought years, but lower yields during years of normal precipitation. He says that traditional plant breeding approaches yield better results. Ultimately for conservationists like me, this is a question of producing more food on less land to cut our inputs, impacts, and costs -- economic and ecological. How will we produce enough food to feed a growing population, while also maintaining the health of the biosphere for our fellow inhabitants of the planet -- and ourselves? It's hard enough to get people to believe in climate change, let alone to become a part of solutions. Heck, even my parents haven't replaced all their incandescent light bulbs with efficient CFL's. If I can't convince THEM, who can I convince?? On the bright side, they've made good progress and are doing a lot better than most Americans at reducing their carbon footprint. As Eban Goodstein recently stated in the Washington Post, climate change is a political problem. We have the scientific understanding and technological know-how to solve it. At this point, it's a problem of motivating people. In this week's GreenBiz Radio segment, Joel Makower gets into the issue of motivation with the author of a new report, "Climate Crossroads: A Research-Based Framing Guide for Global Warming", which aims to offer a first step towards a unified conversation on global warming. The study is a summary of what is known to date about the most effective communications approaches, what works and what won't work to move people to get involved in global warming solutions. What we found is that even with segments of the public who are highly educated and very aware of global warming, there is a very low understanding of what the problem really is. So what we found even in talking to people who are members of environmental organizations or who identify themselves as environmentalists, is they often thought global warming had to do with the problem with ozone holes. The other thing that you find is that most people don't really have a sense of the connection between energy, the economy, and climate, and so most people wouldn't be able to tell you, for example, that their energy or great majority of their energy might come from coal, for example. So a lot of the discussion and in particular, in the media, has leaped ahead into this somewhat elite conversation, but even those who are trying to follow that conversation very actively are missing some fundamental information. So what we really found is that you have to go back and fill in some of those holes. So for example, "green energy" doesn't mean anything to anyone. "Alternative energy" sounds too marginal. Or even needing to make sure that people need to understand that in many ways, we're dealing with the problem with too much carbon building up in the atmosphere. That's very interesting, and points to a greater need for educating the public on the details of warming than I'd have imagined is still necessary. What of talking solutions? CP: I think a growing number of Americans really do want to engage and do things that will make a difference. I think that it's very confusing what really will make that difference and in particular, given how busy people are, how pressed the feel financially, they really want to know if I only have time to do a handful of things, what are the things that are really going to have the biggest payback and biggest impact on solving the problem? I think there's been a bit of a scale issue around solutions where many of the things that the public are being asked to do, don't seem to match the scale of the challenge. So, you know, how can you really solve a global complex issue by changing light bulbs? So once again, back to those feedback mechanisms and really ensuring that we're connecting those individual choices up to the kind of systemic and larger scale change people are interested in, the better. In sum, be careful not to come at your audience from too high of a level (remind them of the basics), and provide them with specific ways that they can get involved, as well as information on the benefits. Something I'd like to add: don't overpromise and pretend that little individual solutions are all people need to do to feel like they've done their part. Remind them that it doesn't take much time to take the VERY important step of giving their policymakers the support they need to enact the bold solutions we realistically need to solve this problem at the societal scale. What Drives Business' Climate Change Strategies? Why are companies interested in climate change solutions? The top strategy related to climate change is energy efficiency, mentioned by 44 percent, and a large number of businesses see significant opportunities coming from lowering energy costs and/or other efficiencies (70 percent), improving stakeholder relationships (67 percent), driving innovation (65 percent) and strengthening credibility with consumers (65 percent). When asked to choose actions that companies should take to rebuild public trust that was lost due to the economic crisis, 39 percent said that companies should create innovative products and business models designed for sustainability, and 38 percent said companies should measure and demonstrate positive social and environmental impacts. Only 4 percent said companies should reform executive compensation. So in sum, climate change solutions just make good business sense. Every time I read stories like this, I think about where we were just 10 years ago. Back in the mid 90's, if you'd have told me how big sustainability would be right now -- that there would be corporate sustainability officers and networks of GreenEverything websites (biz, design, building, climate, computing...) -- I'd have figured you took too many drugs in the 70's. In spite of all the gloom and doom we hear, we've really come a long, long way. Reminding myself of just how far we've come in the last 10 years is the root of my optimism for what we can achieve moving forward. Check out this new star-studded music video calling for world leaders to support bold climate change solutions at the upcoming Copenhagen meetings. Every download will count as a unique digital petition with people adding their names to demand world leaders reach an ambitious, fair and global deal at the UN Climate Change Summit in Copenhagen. One of the big barriers -- THE big barrier -- to going solar and retrofitting homes to be more energy efficient is upfront cost. Sure the improvements pay for themselves over time, but in these challenging times, many people just can't afford the initial investment. Living on Earth reports how the city of Berkeley pioneered an innovative financing program that covers the up-front costs of these types of improvements for homeowners, and allows them to pay the city back via a surcharge on their property tax bill over 20 years. This enables them to get past the barrier of that big up-front cost, and start reaping the economic benefits of clean energy and energy efficiency. If the home changes owners, the property tax surcharge transfers to the new owner, just like the power bill does. CURWOOD: So, Cisco, what gets you excited about this? DEVRIES: We've known for decades that you can save money, that most property owners can save money on energy efficiency in their homes, but we haven't been able to unlock that door. And here today we have this confluence of events: we have the priority around climate change; we have the fact that families are looking for way to save money, especially in this difficult economic time; and we're trying to put people back to work. And that's led to a real focus on solving this energy efficiency financing issue. The thing that really gets me excited is we have the opportunity with this program and some of the leadership in other programs we see coming down the pipe, to help transform the built environment, to really transform the way that people use energy, that they think of energy, and to reduce the amount of energy and greenhouse gas emissions coming from our homes and businesses. CURWOOD: How big could this be, Cisco? DEVRIES: The University of California Berkeley did a study looking at these programs and they said, boy, if this really starts to catch on nationwide, it could be a $280 billion financing program in not too long. And then we would be talking about reducing greenhouse gas emissions to the tune of 1.1 or more gigatons. CURWOOD: And, at net not cost really to anybody? DEVRIES: Property owners really want to do the right thing, but they also need to save money. This is not a time to be putting a lot of extra money out the door if you can avoid it. And I think what we've got here is an opportunity for people to make the retrofits to reduce their energy costs and to put some extra money in their pocket books at the end of the month. And that certainly is a win-win. This is the type of smart policy solution that we here at CVI love. A segment on this week's Living On Earth should give pause to those who consider nuclear power to be a safe form of emissions-free electricity that must be used to help us solve climate change. MANGANO: We found that close to nuclear plants the levels of strontium-90 are considerable higher than areas far away. Number two, we found that levels are going up – since the late 1980s they've gone up about 50 percent, as nuclear plants get older, and are corroding more, and emitting more radiation. And number three, we found the link with childhood cancer. We found that in counties closest to nuclear plants in New York and New Jersey, when strontium-90 in teeth went up, childhood cancer went up; when strontium-90 went down, childhood cancer went down. CURWOOD: What tests have you conducted that show the effects of before and after a nuclear power plant closes? MANGANO: We've done two studies, which looked at eight nuclear plants in the United States that were shut down permanently during the 1980's and the 1990's. And we found that in the first two years after nuclear reactors shut there was a very sharp plunge in the rate of infants that died, in the rate of children born with birth defects, and in the rate of children diagnosed with cancer. Last week, a Pew Research Center poll came out, seeming to show that Americans have become more skeptical about global warming. "Well, we're going into winter right now," I thought to myself. "Ask these same questions during a mid-July heat-wave, and the answers would almost certainly be much different." So the attention I paid to the poll was more to think about what it means for the prospects for passing climate and energy solutions legislation now, rather than how it really reflects the current blip in Americans' all-over-the-place views regarding global warming, in itself. The temptation is to respond to a poll like Pew’s with lamentations about the state of science education—to imagine that the public, like scientists, can be swayed by the weight of empirical evidence. But the most important political takeaway is almost the opposite: popular belief in the science of climate change will follow popular support for clean energy, not the other way around. Make clean energy cheap, easily available, and desirable to the mainstream, and people will stop paying attention to industry-funded cranks and charlatans. There won’t be the same anxiety and loss aversion to exploit. The poll also shows that 73% of people—22% more than believe there’s good evidence for anthropocentric climate change—believe it’s a serious or somewhat serious problem. Some 50% support cap-and-trade, yet only 24% even know that cap-and-trade is an environmental policy. In these incoherent results there is another important lesson: quiz Americans on their knowledge and you get confusion; solicit their goals and aspirations and they are clear. Poll after poll has shown that the public supports clean energy, supports Obama, and wants legislative action. Those are the polls that matter. Good analysis. And right in line with what we've argued here time and again -- there is a broad-based, consensus among Americans of the need to transition to a clean energy economy. Focus your call to action on the environmental, economic, health, security, and quality of life benefits of clean energy-related solutions, and far more people get how these policies will make their daily lives better. Some have argued that the worrisome climate news is that the cost of preventing climate change is too high. In fact, estimates of the cost of acting to mitigate warming have remained relatively stable, while estimates of the likely cost of inaction are becoming unbearable. Whether the goal is 450 or 350 parts per million, this is still a problem we can afford to solve. Stopping global warming remains fundamentally a problem of political will. We are among the eight authors of a recent report for Economics for Equity and the Environment Network, an affiliate of the nonprofit Ecotrust, that surveyed numerous economic studies on the cost of meeting the 350 ppm goal. We found that quicker action aimed at more ambitious targets makes good economic sense. Our report shows that a comprehensive global strategy is well within the range of what most nations are willing to pay to avoid far greater damages from climate change down the line. With investments of roughly 1 to 3 percent of global gross domestic product, or $600 billion to $1.8 trillion, we could rapidly transition from oil and coal to renewables and clean energy sources, including wind and solar, and replenish global forests, which would help trap billions of tons of carbon. These efforts would create jobs and stabilize the climate in the process. Fluctuations or changes in some factors, such as the price of oil, could mean these investments might actually save us money. Do we want to continue to face the growing uncertainties and range of threats posed by continued fossil fuel dependence? Or do we want to create a brighter, more stable economic future that also solves many of our most urgent environmental, health, and security problems? A new generation of biofuels, meant to be a low-carbon alternative, will on average emit more carbon dioxide than burning gasoline over the next few decades, a study published in Science found on Thursday. Governments and companies are pouring billions of research dollars into advanced fuels made from wood and grass, meant to cut carbon emissions compared with gasoline, and not compete with food as corn-based biofuels do now. But such advanced, "cellulosic" biofuels will actually lead to higher carbon emissions than gasoline per unit of energy, averaged over the 2000-2030 time period, the study found. That is because the land required to plant fast-growing poplar trees and tropical grasses would displace food crops, and so drive deforestation to create more farmland, a powerful source of carbon emissions. 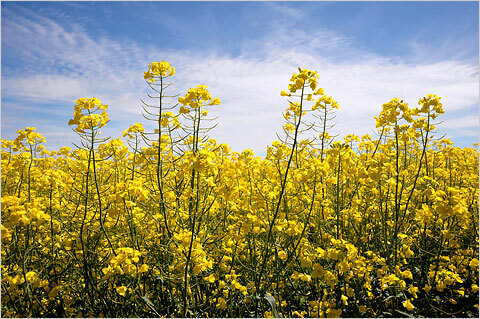 Biofuel crops also require nitrogen fertilizers, a source of two greenhouse gases: carbon dioxide (CO2) and the more powerful nitrous oxide. "In the near-term I think, irrespective of how you go about the cellulosic biofuels program, you're going to have greenhouse gas emissions exacerbating the climate change problem," said lead author, Jerry Melillo, from the U.S. Marine Biological Laboratory. Without steps to protect forests and cut fertilizer use, gasoline out-performs biofuels from 2000-2050 as well. How far we have fallen from the biofuel craze of just a couple of years ago. If we're serious about strong recovery and long-term economic health, we need to get to work building our new energy economy — the most promising new engine for sustainable prosperity. Our regional economy is living proof that prosperity and environmental protection go hand in hand. And climate change has emerged as a new and urgent challenge not only to ecosystems, but to human and economic systems — our water supplies, our hydropower system, our food production, our health. Smart solutions are much cheaper than unmitigated climate disruption. Those who suggest that national climate and clean energy policy will set us back economically are missing the boat. The clean-energy transition is likely to be the strongest driver of innovation and prosperity globally for decades to come. Those of you in swing states, especially, please call your Senators at 202-224-3121 and urge them to support -- and strengthen -- the Boxer/Kerry Clean Energy Jobs and American Power Act (S.1733). (A)a new study in Conservation Biology shows that within 15 years logged forests—considered by many to be 'degraded'—can be managed in order to successfully fight both climate change and extinction. Studying regenerating forests in northeast Borneo, Dr. David Edwards from the University of Leeds, surveyed bird species in three different forests: a protected forest that had never been logged; a forest that had been logged and then actively rehabilitated over the last 15 years; and finally a forest undergoing natural regeneration after logging. Through bird surveys, Edwards found that when a regenerating forest is supported by managed rehabilitation efforts, such as active tree-planting, it only requires 15 years for biodiversity to return to levels near those of unlogged areas. Naturally regenerating forest showed less diversity in the same time frame. But in Southeast Asia many logged forests are quickly turned into plantations, such as palm oil and eucalyptus, which support little biodiversity when compared to forests. Edwards says, "this [study] could act as a strong incentive to protect logged forests under threat of deforestation for oil palm and other such crops. Selectively logged rainforests are often vulnerable because they're seen as degraded, but we've shown they can support similar levels of biodiversity to unlogged forests." 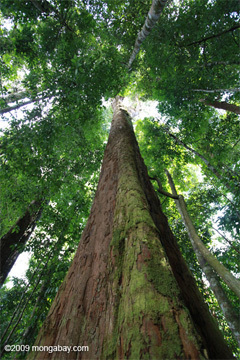 Edwards further argues that his study proves carbon trading projects within rainforests, like REDD, should be linked directly to preserving biodiversity. "Our research shows that it is possible to have both carbon sequestration and biodiversity benefits within the same scheme," Edwards says. "There are now suggestions that carbon crediting and 'biodiversity banking' should be combined, enabling extra credits for projects that offer a biodiversity benefit. We believe this should be introduced as soon as possible, to ensure maximum support for rehabilitation schemes in the tropical rainforest." These are intriguing findings that provide the kind of data we need to evaluate the effects of conservation and restoration actions on ecosystem services beyond carbon sequestration -- which is the one "service" that payments for ecosystem services schemes such as REDD currently compensate landowners and countries for. One of the types of stories that we post here are "impacts of unsustainability" stories -- stories about all the bad things that the solutions we write about will help us avoid. The prestigious journal, Nature, has an eye-opening piece about the multiple threats that global warming is posing to Himalayan countries such as Bhutan. It's not just the scary thought of losing their drinking and agricultural water supplies -- a story that we have covered in several posts. Every country within the Himalayan region has suffered a glacial outburst flood at some point3, and Bhutan is no exception. 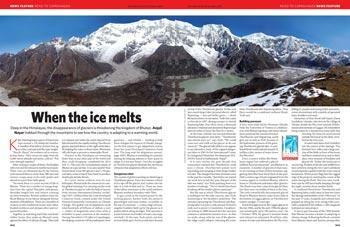 The only scientifically documented glacial flood in Bhutan's history came from a lake at the bottom of Luggye glacier, on Thorthormi's eastern margin, 15 years ago. On 7 October 1994, the glacier's moraine broke and released an estimated 18 million cubic metres of water and debris down the Pho river, killing 21 people and razing fields and settlements downstream with a jumble of uprooted trees, boulders and mud. Memories of that flood still haunt Dawa Gyeltshen, a herder who lives in the village of Taksho, beside the Pho river around 20 kilometres downstream of Luggye. He remembers being woken by a thunderous noise early that morning. For hours he raced around outside his house in the dark, terrified as the river rose. It wasn't until dawn that Gyeltshen saw the extent of the damage. The forested river valley and a large portion of the fields in front of his house had been washed away and in their place were mounds of boulders and glacial silt. .
A combined flood from Thorthormi and Rapstreng lakes (whose dams are in danger of collapsing as early as 2010) could cause at least ten times the damage and fatalities of the 1994 event4. It was in part because of the 1994 disaster that Bhutan became a leader in adapting to climate change. One of the fun things about following the sustainability movement day in and day out is that you start to see patterns and themes crop up and fade away. The biodiesel craze has faded considerably, for example. But rising very quickly is a movement to revolutionize our food production and delivery system -- to make it more sustainable for both the earth and ourselves. By bringing locally grown, organic, nutritiously rich food to a table near you, the good food revolution can help us tackle these larger societal issues (e.g., climate change and health care), and benefit us all. We need a revolution in our food delivery system because the global $3.2 trillion processed-food industry is undermining our health and significantly contributing to our carbon footprint. Let's take a quick look at how produce in Massachusetts makes it to our grocery store shelves. Quite likely it was picked in California's Central Valley, the mother of all breadbaskets. The produce journeyed across the country from the field to the wholesaler to a retailer and finally to your dinner table. Total travel time, about 12 to 14 days. Have you ever wondered how much nutrition is left after that voyage? Not much. You're largely eating vacuous cellulose -- even if you buy it from Whole Foods. This long journey also exposes it to multiple handlers and contaminants that create health scares -- recalled meat, tomatoes, peanuts -- that are regular features on the nightly news. Have you ever wondered how many greenhouse-gas-emitting-food miles it took for that nutritionally leached meal to arrive on your plate? Green Cities California, the collaborative of 10 cities and counties acknowledged as sustainability leaders, launches a website today that's to serve as a resource for other communities striving to go green. The website, www.GreenCitiesCalifornia.org, is designed as a repository of best practices and other tools for policymakers who are trying to improve the environmental performance of their locales. "Certain cities have already blazed a trail (toward sustainability) and it would be so much easier if that information were available to others," said David Assmann, who is the deputy director of San Francisco's Department of Environment and a member of Green Cities California's steering committee. "There are obstacles and issues you have to look at," he said. "In virtually every area there are stumbling blocks, and the site enables everyone to learn from each other." Say you're trying to develop a zero-waste policy for your town and you want to know what other local governments have done to wipe out waste, but you don't have a big budget for research or a lot of time to do it. The Green Cities California site summarizes zero-waste efforts in Oakland and San Jose -- and provides 15 documents that can be used as templates as well as links to sites that can serve as models for your efforts. Change is almost always easier to enact locally than at state and national levels. It will be neat to watch as this California-based resource generates case study additions from both across the state and -- perhaps -- across the country. While “light green” consumers make purchasing decisions based on impulse and curiosity, “dark green” consumers generally plan purchases in advance, according to a new survey from Grail Research. 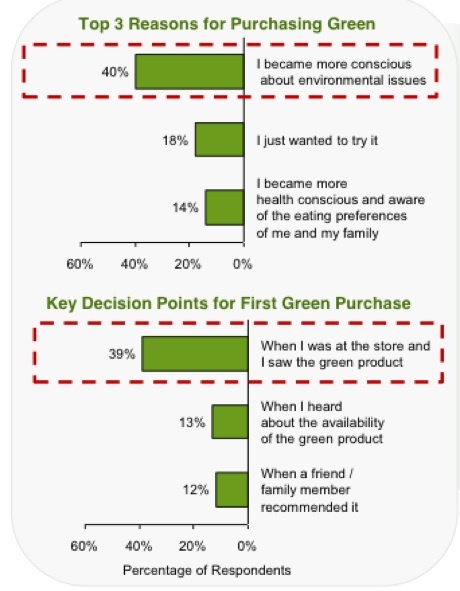 Marketers would do well to pay attention to the light green consumers (above), who make up 89 percent of those that say they purchase “green” items. The dark green consumers, on the other hand, make up just 9 percent, according to “The Green Revolution” report (PDF). One of the most illustrative differences has to with the key decision behind making a first green purchase. About 39 percent of light green consumers say they simply happened to be at a store and noticed the product, and just 13 percent took action after hearing the product was available. For dark green consumers, about 29 percent decided on the purchase after hearing the product was available, and 20 percent of them made a decision when they were at a store and noticed the product. What's the take home message? The results of this study would seem to indicate that more we can green products into stores, the more people will buy them. This is both good and important -- as long as the products can be trusted to provide credibly lower production impacts, use impacts, and re-use/disposal impacts. 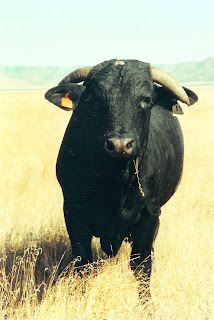 The FAO's widely-cited 2006 report Livestock's Long Shadow listed annual greenhouse gas emissions from livestock to be 11.8%. However, Worldwatch shows that the FAO severely undercounted or misallocated emissions from a number of areas in the livestock production chain. More than anything it seems an exercise in making sure emissions are properly attributed. Yet another reason to hug a vegetarian. If you like to eat meat, as I admittedly do, you can still dramatically reduce your impact by sticking with organic chicken and MSC-approved fish, and by avoiding beef as much as possible. (A new solar power) plant, which got the go ahead from funders only a few days ago, will cover approximately one acre of productive, organic farmland and will be designed from the outset to enhance cultivation as best it can—double cropping solar with food. From protecting tomatoes from rain (tomatoes do better if only their roots are fed), through shading cooler weather crops like salad and arugula as our climate heats up, to providing support for trellises and other crop infrastructure, the idea is to find ways that we can grow food and harvest energy as symbiotically as possible. At some point recently, maybe due to the birth of my first child, I started plugging in a little less -- cutting down my time on Twitter, FaceBook and texting and increasing my time focusing on my immediate surroundings. I know I'm far from the only one starting to move in this direction. The Triple Pundit reports on "No Impact Week" -- an educational effort to reduce our environmental impacts, save money, and, it turns out, be happier. No Impact Week is targeting the grassroots level of individual consumer behavior, methodically guiding more than 4,000 volunteers through daily experiments on reducing their impact. The themes of buying locally, boosting local economies, eating seasonally, not driving as much, and eliminating waste run throughout the topics. What the founder of the No Impact Project, Colin Beavan, discovered when he and his family went off the grid and bought nothing new for a year was that they weren’t suffering as a result of reducing their impact. In fact, they were actually happier. Maybe the real solution to creating sustainable economy is understanding what really makes us happy. I know I'm happiest and feel the best when camping alongside a rushing river in a remote National Forest wilderness -- when I unplug and reconnect with the earth. For too many people, this level of happiness is achieved through...shopping for stuff, which is a dangerous -- and unsustainable -- behavioral phenomenon. Here's more on the report I blogged about Thursday -- about the hidden health, environmental, and other costs of our current fossil-fuel-focused energy supply system. A new report from the National Research Council on the “hidden costs of energy” is, frankly, stunning. In a sane world, it would be headline news. Producing and using energy imposes all sorts of costs on public health, crop yields, ecosystems, recreation, educational performance ... the list goes on. Many of these costs don’t end up reflected in the market price of energy; consumers don’t see them or factor them into purchasing decisions. They are hidden, paid indirectly through, for example, health-care spending or environmental-remediation costs. Such costs are external to energy markets—externalities, as economists call them—and they represent an enormous subsidy to the dirtiest sources of energy. First, note that the report did not attempt to quantify the damage to ecosystems and agriculture wrought by climate change. It did not attempt to quantify the national security costs of securing energy supplies. It did not attempt to quantify the land-use costs of biofuels. It didn’t attempt to quantify the costs of mercury pollution, which as Bill Chameides documents, are substantial. It didn’t attempt to quantify the impact on taxpayers that subsidies to the coal industry impose. So a huge chunk of costs were written out, meaning the results are extremely small-c conservative. Nonetheless, the NRC found that hidden costs amounted to $120 billion in 2005. I didn't mention this in my post the other day, but these hidden costs of fossil fuel use also include things like reduced worker productivity, businesses having to pay workers for sick days (and days they're not feeling great because the air quality stinks -- no pun intended), school absences (and parents having to stay home from work to care for sick children), and so much more. Can Mushrooms Help Save the World? One of our most overlooked components of biodiversity -- without which humanity could not do without -- is the kingdom of fungi. The benefits of fungi span far beyond the delicious morsels of shitaki and chantrelle mushrooms that we enjoy as foods, or the psylocibes that some partake in to refresh their ideas and spirits. The Ecologist has a good piece about mushroom guru, Paul Stamets -- his work understanding and communicating their eye-opening benefits to humanity. Mushrooms are often thought to be little more than parasites which cause illness and destruction in plants. But their role is far more subtle, complex and varied. They are crucial to ecosystems, breaking down matter and recycling nutrients. In Paul's words: 'Fungi are the interface organisms between life and death - without them, all ecosystems would fail.' Neither forests nor fungi could exist without the other. While much of the debate and action has focused on curbing emissions from burning fossil fuels such as oil, coal, and gas, the destruction of our forests, wetlands, grasslands, and peatlands is responsible for about one quarter of all other emissions into the atmosphere. That’s higher than emissions from cars, trucks, boats, and planes together. In Canada and throughout the world, forests are being rapidly cleared for agriculture and oil and gas development and are being destructively mined and logged. When forest soils are disturbed and trees are burned or cut down for wood and paper products, much of the carbon stored in their biomass is released back into the atmosphere as heat-trapping carbon dioxide, although some carbon can remain stored in longer-lived forest products, like wood used to make furniture or homes. Thus the destruction of forests and other ecosystems is not only a driver of extinction of species, such as boreal caribou, but is a driver of global warming as well. We need to adopt a carbon stewardship approach to how we use our forests and the goods and services we take from them. For some scientists, carbon stewardship means setting aside at least half of all remaining intact forests as protected areas, particularly carbon-rich forests like old-growth temperate rainforests in B.C. and the boreal in Canada’s north, where wildlife like caribou feed, breed, and roam. Protecting intact forests also promotes ecological resiliency so that species and ecosystems can cope with and adapt to the effects of climate change. That doesn't mean that the logging companies should be allowed to trash the other 50 percent. Forests that we do manage for wood and paper production should be logged according to the highest standards of ecosystem-based management—without clear-cutting and with adequate protection for wildlife habitat like caribou as well as sensitive areas like wetlands. We're going to need every tool in the tool box, from the low-hanging fruit of energy and building efficiency, to mass proliferation of clean and stable renewable energy sources, to a revolution in sustainable agriculture, to protection of vital services provided by forests and other ecosystems, from carbon sequestration to fresh water provision. It is a monumental challenge, the likes of which humanity has never faced before? You bet! Somehow, some way, we're going to have to figure out how to feed a growing human population, while at the same time solving the crisis in global land use: reducing humanity's devastating impacts on the biosphere -- from climate change, to habitat destruction and biodiversity loss, to doubling of the global nitrogen cycle, to toxic pollution. The London Telegraph lists some types of genetically modified crops that have the potential to help us produce more food more efficiently -- on less land and requiring less resources. It also briefly summarzies other solutions, including use of ecosystem services and better irrigation techniques. Granted, we've learned some hard lessons about the dangers of genetically modified crops, and we need to proceed with the utmost of caution. But given the need to feed more people in a warming climate with shrinking fresh water supplies, these types of solutions will prove essential to supporting both human well-being, and the well-being of our fellow inhabitants of the earth. This should be a no-brainer of a partnership. Especially at a time like now, when it's ever so urgent to put aside differences and focus on building the support needed to get strong climate change and clean energy solutions legislation passed -- whether you're concerned about energy security, fish and game, biodiversity, green jobs, or cutting off the flow of oil money to terrorists. Perhaps the thing that struck me most was how much the outlook on peak oil has changed since the first conference in 2005. Four years later, the view on oil and biofuel has grown considerably worse. We now know that conventional crude did in fact hit its peak-plateau in 2005, having remained around the 74 mbpd level ever since. The expected growth from non-OPEC mostly failed to materialize... More pessimistic observers now think the 87 mbpd all liquids peak recorded at the height of the 2008 boom was the peak, and the more optimistic ones have cut their expectations to under 100 mbpd, with 90 mbpd looking more likely. Biofuels now have a black eye from the corn ethanol frenzy of 2007-2008, which has all but collapsed. Ethanol from algae and cellulose still looks about as far in the distance as it did in 2005, as no one has figured out how to produce either one at commercial scale or with an acceptable net energy return. And biodiesel has remained a minor player, with little expectation for it to scale up any time soon. But the most surprising change has been the outlook for North American natural gas. In 2005, the majority of observers seemed to think it had peaked for good, and saw gas prices remaining in a high range of $11-15/Mcf. I don’t think any of them expected the recent boom in North American shale gas, and there was certainly no suggestion that gas prices would crash to nearly $2 this year. In fact the main worry about gas now seems to be that the shale gas boom will prove to be short-lived, and sucker us into building more vehicles and infrastructure to use it just as it sputters out. Is LEED Breaking Up with FSC-Certified Wood?